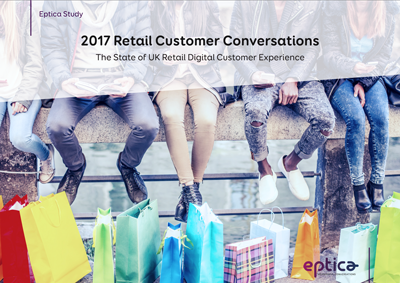 Study: Customer Conversations - The State of UK Retail Digital Customer Experience | Eptica - Multi Channel Customer Interaction Software. Email Management. Web Self-service. Live Chat and Agent Knowledgebase. Despite 93% of consumers revealing they are more likely to buy if they receive a positive customer experience, UK retailers are struggling to deliver adequate, consistent service new research suggests. Companies were unable to answer 46% of customer queries received on email, the web, Twitter and Facebook, with only 7.5% responding on all four channels - and a mere 2.5% providing a consistent, accurate answer across all of them.